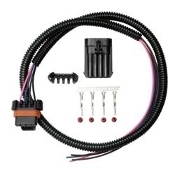 Moroso LS1/LS6 primary coil wire extension harness kits are an efficient way to remotely mount your coils. Complete with a protective shield, these harnesses plug into your factory harness and coil and include a weather-tight seal to prevent corrosion. Includes eight 3 ft. length extension harnesses with male plugs, female plug, and hardware.